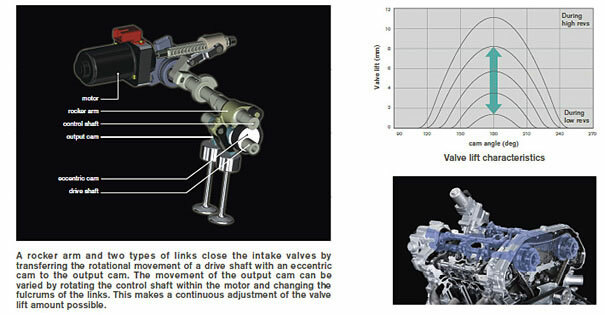 NISSAN's newly developed Variable Valve Event and Lift (VVEL) system for realizing unprecedented balance of responsiveness and power, fuel efficiency and low emissions. Fuel efficiency and engine torque have been improved by substantially reducing intake resistance, which conventionally occurs when the throttle valve of an engine running at low revs is closed. 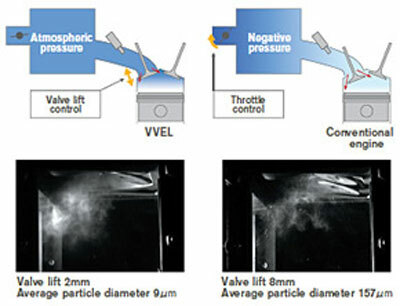 Throttle response has been improved by directly controlling the amount of intake with the intake valve rather than the throttle valve, where it has conventionally been controlled. By reducing the amount of valve lift when the engine is running at low revs, the intake flow rate is increased and full combustion becomes easier. This reduces emissions of hydrocarbon (HC), which can be produced during partial combustion cycles.